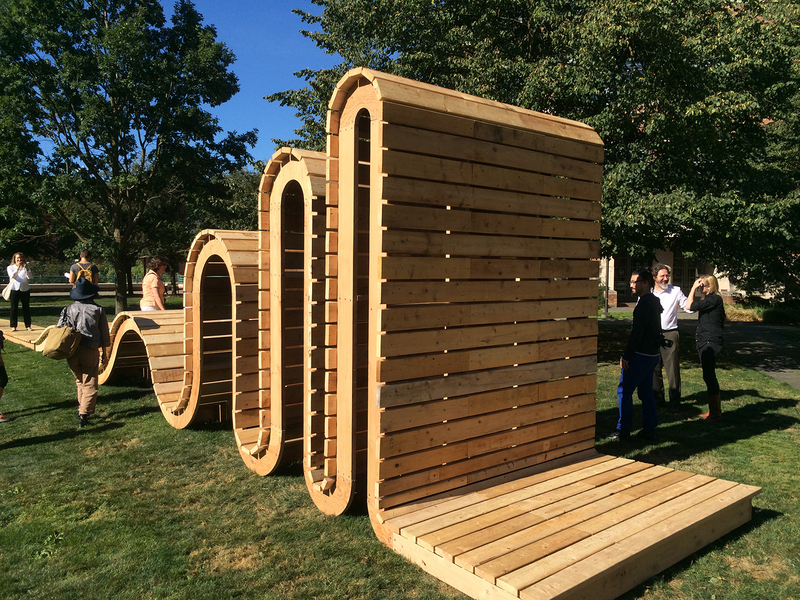 From Sept. 13 through Oct. 25, ArtsUW will team with the local organization MadArt for an outdoor public art exhibit that spans about 2 ½ miles around campus and encourages visitors to discover art in unexpected places. The exhibition will feature 12 large-scale, temporary, site-specific works inspired by their locations, from hidden nooks to well-frequented vistas. The exhibited works will include art by eight UW alumni, one of whom, Julia Chamberlain, is pursuing a second undergraduate degree. Sept. 28, 11 a.m. to 3 p.m.
A free, family-friendly way to experience the campuswide exhibition — meet the artists, take guided tours and grab snacks and swag. It all starts on Red Square, so just show up. Learn more. A final chance to tour the exhibition as the campus celebrates Husky pride and the university’s founding with a half-day of activities. Learn more. Students in the UW School of Art + Art History + Design — the school’s new name as of this year — are helping Mad Campus artists as they prepare their pieces, designing promotional materials, acting as docents and even documenting the artists’ process with a video project. Come the start of school, several courses will integrate Mad Campus into their curricula. “It’s a great opportunity for our students to get a close-up view of the entire process behind the creation and installation of a dozen unique sculptures on their own campus,” said Jamie Walker, director of the school. MadArt is a privately funded organization founded by UW art history alumna Alison Milliman. It is dedicated to supporting emerging artists and sharing their work in unexpected settings. The Mad Campus project was Milliman’s idea. 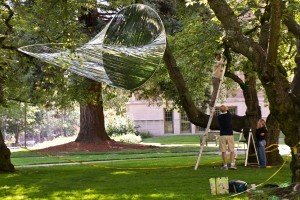 Milliman and MadArt Director Tim Detweiler, working with UW staff members, invited several dozen artists to send in proposals, and chose 13 Pacific Northwest artists to come to campus and create their temporary installations. Milliman started MadArt after spending a year in Melbourne, Australia, where she found a lively art scene filled with emerging artists whose works were often down alleys and in unusual parts of the city. 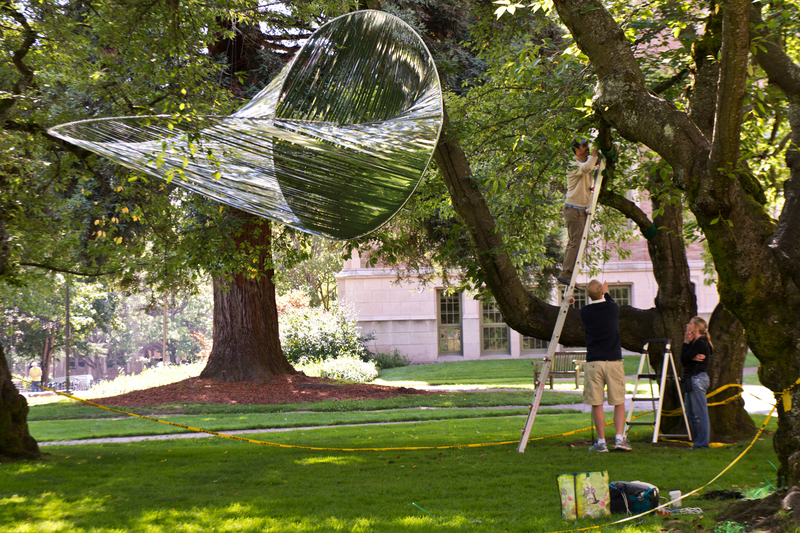 The group’s first show was The Window Art Project in Seattle’s Madison Park in 2009, and the next year it produced MadArt in the Park, followed by Mad Homes in 2011. That year the group also opened the MadArt Space in South Lake Union, where large-scale artwork is created and the process can be viewed by the public. In a press preview tour Thursday cheerfully led by Detweiler, Walker said he was proud that the UW quickly agreed to support the project. Maps of the Mad Campus exhibit will be available online and at the UW Visitors and Information Center, and are available online as well. Evan Blackwell, Master of Fine Art. Julia Chamberlain, Bachelor of Science, working on Bachelor of Fine Art. Paul Komada, Bachelor of Fine Arts. Saya Moriyasy, Bachelor of Fine Arts. Piper O’Neill, Master of Communication in Digital Media. Alyson Piskorowski, Master of Fine Art. Maki Tamura, Bachelor of Fine Art. W. Scott Trimble, Bachelor of Fine Art.